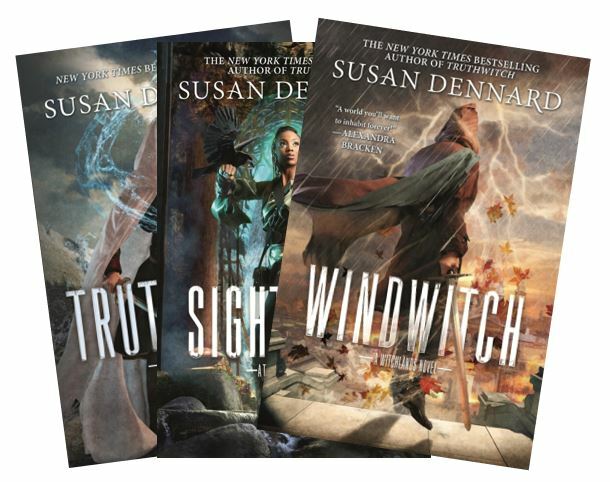 ATLANTA, Sept. 2, 2018 /PRNewswire/ -- The Jim Henson Company has optioned "The Witchlands" books, written by best-selling author Susan Dennard, to be developed as a live-action television series. The surprise announcement was made today by Halle Stanford, President of Television for The Jim Henson Company at a Dragon Con panel led by Dennard and Stanford entitled "Two Misfits Who Dream: Women Who Create Fantasy Worlds." The series is set in a world where three empires rule and every member of the population is born with a magical skill set, known as a "witchery." Now, as the Twenty-Year Truce in a centuries-long war is about to come to an end, the balance of power will fall on the shoulders of two young women Safiya and Iseult, who must accept their fate, and themselves, to survive. Published by Tor Books, with two of the books and a spinoff already on the shelves, the third release in the series, "Bloodwitch," is set for February 2019. "'The Witchlands' features a world of magic and astonishing characters that our Creature Shop can sink its teeth into and bring to life in an exciting and fresh way," said Stanford. "These books fulfill our desire to dive deep into a high fantasy world a la 'Lord of the Rings' or 'Game of Thrones,' where the women are the heroes and the world itself is seen through a feminine lens." Dennard said, "I'm so thrilled that 'The Witchlands' is in the hands of such a dynamic and creative company as The Jim Henson Company. This is a literal dream come true, and I can't wait to see what they come up with to bring the world, characters, magic, and creatures to life!" Lisa Henson, CEO and President of The Jim Henson Company and Stanford, will serve as executive producers for the project. Susan Dennard will serve as co-executive producer. The Emmy Award-winning Jim Henson's Creature Shop will create the creature characters for the series. A favorite of booksellers, reviewers, and readers alike, Susan Dennard has become widely known for her young adult epic fantasy saga set in the imaginative world of her New York Times bestselling series published by Tor Teen, "The Witchlands," told through "Truthwitch," "Windwitch," the special illustrated novella "Sightwitch," and the forthcoming "Bloodwitch" (February 2019). The "Witchlands" is set on a distant continent, in which some are born with a "witchery," a magical skill that sets them apart from others. The series follows best friends Safi (a Truthwitch) and Iseult (a Threadwitch), as well as the cunning ship captain Prince Merik (a Windwitch), and the mysterious and powerful Aeduan (a Bloodwitch) as they must navigate warring empires, political machinations, and mercenaries who seek to use their magic for selfish gain. Any fan of a gripping and fast-paced fantasy saga will be captivated by the wonderful world of "The Witchlands," where Dennard focuses on the true power of magic, bravery, and most importantly, friendship. The Jim Henson Company has remained an established leader in family entertainment for over 60 years and is recognized worldwide as an innovator in puppetry, animatronics and digital animation. Best known as creators of the world-famous Muppets, Henson has received over 50 Emmy Awards and nine Grammy Awards. Recent credits include "Julie's Greenroom" (Netflix), "Dot." (Universal Kids /Hulu), "Splash and Bubbles" (PBS), "Word Party" (Netflix), "Doozers" (Hulu/ Sprout), and the Emmy®-nominated "Sid the Science Kid" (PBS), "Dinosaur Train" (PBS), and "Pajanimals" (Universal Kids). Television productions include "Fraggle Rock," "The Storyteller" and the sci-fi cult series "Farscape." Features include Disney's "Alexander and the Terrible, Horrible, No Good, Very Bad Day," as well as "The Dark Crystal," "Labyrinth," "MirrorMask," and "Jim Henson's Turkey Hollow." The Company is currently in production on the upcoming Netflix original series "The Dark Crystal: Age of Resistance." Projects in development include the highly anticipated film "Fraggle Rock." With additional locations in New York and London, The Jim Henson Company is headquartered in Los Angeles on the historic Charlie Chaplin lot, complete with soundstage and post-production facilities. The Company is home to Jim Henson's Creature Shop™, a pre-eminent character-building and visual effects group with international film, television, theme park and advertising clients, as well as Henson Recording Studios, one of the music industry's top recording facilities known for its world-class blend of state-of-the-art and vintage equipment. The Company's Henson Alternative brand is currently touring "Puppet-Up! – Uncensored," a live puppet improvisational show, and its feature "The Happytime Murders," starring Melissa McCarthy was released this summer.